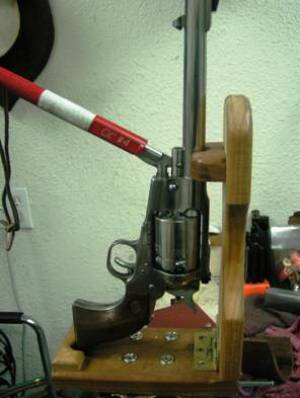 Tired of gouging your palm while loading your Cap & Ball Revolver? Need that extra leverage to seat your balls? A standard Slix-Hand on a 5-1/2” Colt. Notice the radius on the mouth of the hand has been modified to clear the frame with the shorter barrel and loading lever. TK4B Enterprises, makers of SliXprings, SliX-Pins and SliX-Main announces a new innovation for loading your Cap & Ball revolvers. After several experiments with padded gloves, sawed-off broom handles, pieces of pipe and old crescent wrenches, the folks at TK4B decided a righteous tool for loading C&B pistols was needed; ergo, the SliX-Hand. 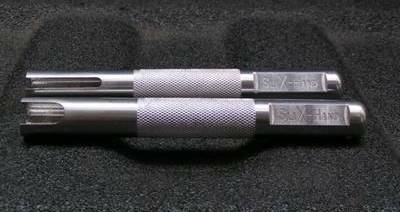 A high quality tool machined from solid aircraft aluminum that is configurable for any of the more popular C&B pistols. You will no longer need to deal with sore palms, having to find and use a pair of gloves, worrying about a wrench slipping off and scratching your valuable pistol, or excessively bending your loading lever by using the wrong tool. As with all of the SliX branded products, one size will not exactly fit all. 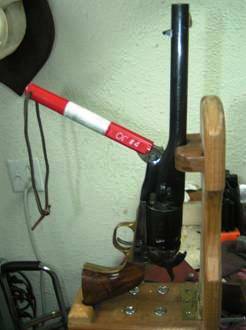 The new model SliX-hand is designed to fit both narrow and wide loading lever ribs and can easily be fit for wider levers outside the standard dimensions, like the Colt’s 1851’s. At the most, a simple operation of minor filing either the length or width of the lever slot will have the SliX-Hand working for your specific pistol. 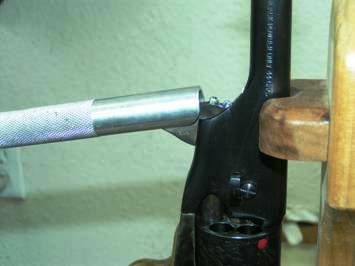 Most shorter barrel pistols will require some amount of beveling or a radius of the tool mouth to clear the barrel frame. 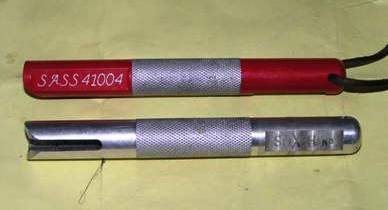 In addition to merely having a useful tool, the refined shooter may also customize their SliX-Hand with a variety of powder coated colors and/or with your personalized alias and SASS number on the sides. This customized service is only available if purchased through the Desperado Cowboy Bullets shopping cart.